Padilla J, Simmons GH, Newcomer SC, Laughlin MH. Relationship between brachial and femoral artery endothelial vasomotor function/phenotype in pigs. Exp Biol Med (Maywood). 2010 Nov;235(11):1287-91. Epub 2010 Sep 17. Oberle RL, Das H, Wong SL, Chan KK, Sawchuk RJ. Pharmacokinetics and metabolism of diclofenac sodium in Yucatan miniature pigs. Pharm Res. 1994 May;11(5):698-703. Panepinto LM, Phillips RW. 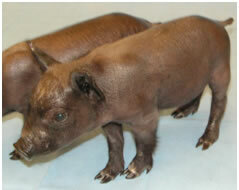 The Yucatan miniature pig: characterization and utilization in biomedical research. Lab Anim Sci. 1986 Aug;36(4):344-7. Review.